This is the last post I will write about President Trump. Of course, I promised that after the first post I wrote about the Donald. But like most people who love rubbernecking a trainwreck, I can’t look away. He’s so outrageously inhuman, so preposterously un-PC that it feels as if our nation’s collective unconscious has been cast in a reality show gone horribly wrong. I’m not alone. I listen to people make predictions, count the days to his coming impeachment. Wake up, America. We need Donald Trump. The same we needed Tonya Harding. The same way we needed Rosie Ruiz. Do you remember her? She cheated at the Boston Marathon over thirty years ago. But even non-runners alive that day remember her name. Could you tell me which President was in office on the day Rosie Ruiz “ran” Boston? You know from my posts I believe there’s a small, ugly part of each one of us that loves to hate this President–and that means there is a small part of each one of us who is egging him on. Before you adamantly deny this, please give me a chance to explain. We need cheaters. They make us feel morally sound…they make us feel that our system–all those checks and balances our forefathers set in stone–really work. Do you remember Jason Blair? He cut some corners on the way to the finish line. Do you remember Janet Cooke? She won a Pulitzer, until The Washington Post found out she made up the whole story. Fake news has been around for a lot longer than we are willing to believe. We need fake news because reality is sometimes too hard to accept. And that’s the same reason we need fiction. Only fiction has changed. And we need to study it if we want to know what’s really going on. If you know me, you know I write contemporary fiction. You know I’ve written a YA novel called Cease & Desist about a reality show gone horribly wrong. People love reality shows for one simple reason; we love to watch people in distress. We love to watch them cut corners and get caught. But when our beloved reality show gets transferred onto the all-too-real world stage, we get scared. We helplessly lash out at the bad guy. 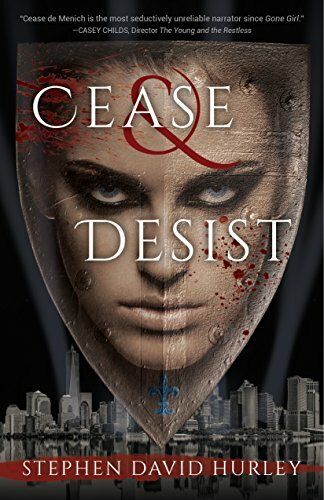 Cease & Desist is a book about a bunch of young people who do some pretty terrible things while the whole world watches, and votes for a winner. Donald Trump may be evil. But he’s one of us. He may be a cheater. But so are many of those we trusted to report the truth. Do you want to know how this unreal reality show is going to end?